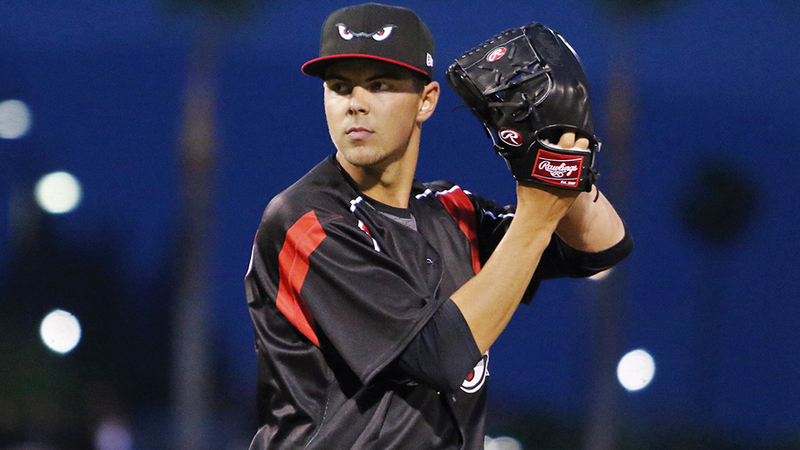 It's only mid-April, but MacKenzie Gore already has done something in 2019 that he hadn't done at all last season: He's won a weekly award. MLB.com's No. 15 overall prospect has been named California League Pitcher of the Week after posting zeros in each of his first two starts with Class A Advanced Lake Elsinore. He scattered six hits and two walks while striking out 15 batters over 10 innings. For a left-hander who wasn't able to make his second start of 2018 until May 8 due to blister issues that continued to be a problem for much of the season, Gore said he was happy to enter his second full season totally healthy. "Just being able to work on the craft and not get asked, 'Are you OK' when I'm done throwing [has been big]," he said on the Minor League podcast just before Opening Night. "I just get to go out there and throw the baseball." The 2017 first-rounder got good results right out of the gate, striking out eight while yielding four hits and a walk over five innings in a 4-0 win at Inland Empire on April 5. Six days later against the same team -- this time at home -- Gore was even stingier, limiting the 66ers to two hits and a walk while fanning seven in five frames again. In all, the 20-year-old has struck out 41.7 percent of the batters he's faced this season -- the third-best K rate among California League pitchers and fourth-best among all Class A Advanced hurlers. His 7.5 K/BB ratio places fifth in his circuit, and he's one of only three Cal League qualifiers yet to give up an earned run in 2019. Taken with the third overall pick two years ago, Gore stood out with a four-pitch mix that included a low-to-mid-90s fastball and a plus curve. His slider and changeup also have the chance to be above-average offerings, and his impressive control makes the whole package play up -- evidenced by only two free passes in 10 innings with the Storm. The results weren't quite there in 2018, however, as Gore was limited to only 16 starts with Class A Fort Wayne and posted a 4.45 ERA and 1.30 WHIP -- though the potential still stood out with a 74/18 K/BB ratio through 60 2/3 innings. "The hype is good and you have to appreciate that the fans are excited," Gore told MiLB.com's Katie Woo on Friday. "But I have to ignore the noise because if I get caught up in the hype, I'm not going to be as good as I can be or as good as I need to be. "That's what the Minor Leagues are for. It's good to have this stuff now so that I know how to handle it when I get up to the big leagues. Everyone has all these expectations for you, but at the end of the day, whatever your expectations are is how good you're going to be." Now with two of his best Minor League performances in his pocket, it's hard not to think about a potential timetable for Gore adding to San Diego's increasingly talented young core in the Majors alongside Fernando Tatis Jr., Luis Urias, Chris Paddack and Francisco Mejia. He isn't about to get ahead of himself, however. "You are going to hear me say this a lot, but I want to dominate every day and not look ahead," Gore told MiLB.com's Andrew Battifarano after his season debut. "That is how you keep from getting too high or too low."